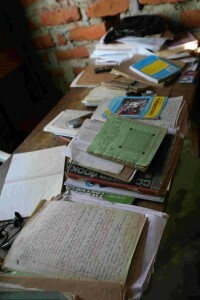 Teacher’s “Lounge”- Kwa Muema High School. St. Mulumba’s is one of the high schools we support. We have constructed 2 classrooms and a library for the school. Every year, we fund scholarships and school supplies, working closely with the Principal and the librarian to provide upto date materials and resources to the student and community. Scholastic Journey, a charity based in the US, has provided pens for the school. Mulundi Primary School was constructed in 1966 to help a young nation then provided elementary and middle school education to her citizens. Currently the school provides early childhood education, primary education and there is a dispensary on the school compound. Books and Bricks provides books to the community library every year. With the help of local community leaders students who were from disadvantaged family backgrounds who had academic promise for scholarships. Since secondary school is not free in Kenya many families struggle to meet this expense. Our scholarship program includes a Mentoring Program for our students. Every year we offer high school and college scholarships to the community.